♥ …Also, just wanted to let you know-Billie is doing AMAZING! Therpist2 is wonderful with him. Therpist1 was lovely and worked well with Billie, however, Therpist2 has been getting him to do things that I did not see last year at all. He is trying to communicate more with me and with the other students. Billie is happy and engaged in learning when Therpist2 works with him. She is a lovely lady and so good with him. I am so pleased with what he is doing in class. Tomorrow we are going to show his science project during class – he did a great job on the assignment. Therpist2 and I were brainstorming ideas for Billie to participate in the event at the end of the year…. ♥ Doctors don’t know everything. In February of 2011, the lead neurologist… told us that our oldest son (then 2.5 years old) would only continue to regress to the point where he’d become so aggressive we’d have to medicate him (which he showed no aggression at the time) and that he threw up every day bc he was autistic, cried all night bc he was autistic, and while he didn’t have a crystal ball, he said he’d probably eventually need to be institutionalized. He said he was 100% confident in his diagnosis. Through reading and research, a second opinion and holistic approach guided by Dr Brian D Udell, extensive tests on food sensitivities and bacteria imbalances (due to antibiotic abuse from his previous pediatrician) a radical change in diet, faith and determination we reversed that diagnosis and restored his health. ♥ Hi Dr. Udell, just wanted to show you an example of a good day for Bobby outside of all the movement you constantly see in your office… On a different (positive) note, see pic below at the School Award Assembly. Bobby walked up from the back of the cafeteria and up the ramp on to stage by himself, waited for all the other kids to get in position for pic and walked down. Huge difference from last year, he had someone with him the whole time. It was great to see all that independence growth from one year to the next! ♥ I just wanted to give you my perspective on what I am observing with Pat so you can understand why I am so adamant about increasing her dose back to the 3cc’s on Fluconazole. She was a straight A student last year on this dose and is now struggling this school year. I don’t know what it is about this medication but, it is magic for Pat and keeps her focused and on track. ♥ Hi Dr. Udell. I wanted to update you on Darien’s behavior, constipation and my opinions on the Diflucan. We last saw you Sept 15. On Sept 16, his behavior got him sent home from preschool for the day. He was miserable Sept 17-19, constantly repeating “you didn’t say something?” and “nothing hurts?” And having tons of outbursts. The 19th was the worst. I took him to a first visit with his new play therapist and he was screaming and throwing things. ♥ We are out of probiotics and have been for a week. We have noticed an increase in crying and pain with Robert. He also had loud farts with terrible smells. ♥ I wanted to share this with you, it is about Henry and his horse riding therapy. He is doing a little better every day. Thank you for being part of our journey. ♥ Hello from Nassau! Sheena has been doing quite well since our visit. The Benefiber is WORKING !!!! She has a poop most days. It is formed but not hard, just pointy! … So she is doing well and we are grateful. Take care and see you in May. 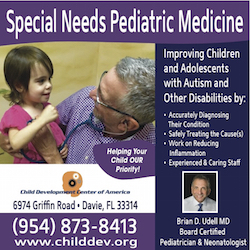 ♥ From Dr. Robert Melillo, author of Disconnected Kids, many tweets about “10 Things All Pediatricians Should Know About Autism” and “The Law, Antibiotics, and Autism“. ♥ Everything is very open with a very clear clarification of the issues. ♥ I like the valuable info you provide in your articles. I am quite sure I will learn a lot of new stuff right here! Good luck for the next! ♥ I read a lot of interesting articles here. Probably you spend a lot of time writing. ♥ Hi Dr Udell, Karen & all your wonderful staff… for your help in the process of getting Maria switched to a bus that has AC/Heat capability… We are so thankful to God for good people like you guys that care and have helped us in the journey of advocacy for our little ones so that they can have all the resources available to be able to become functional & exceptional adults someday…I demanded that they read the letter & reviewed the case again that they realized their mistake & even apologize for their ignorance. Maria can finally resume classes & continue to enjoy learning her ABCs. Thank you again, very much, for ALL THE WONDERFUL WORK YOU DO! ♥… We are just so eager to get his little gut ready for the LDN and B12 shots……again thank you for everything!! Our regards to the whole staff….they are awesome. You definitely give parents hope…by taking the time answer all of our questions and concerns….we are so thankful…..you are amazing!! Perhaps, I’m just ‘preaching to the choir’. For years, reknowned ABA guru, Dr. Doreen Granpeesheh, has spoken about the improved outcome when parents combine ABA with biomedical techniques. Similarly, prominent researcher, Dr. Martha Herbert, has emphasized the whole body conditions that can be addressed in this manner. By combining the time-tested improvements from ABA, OT, PT and S&L therapies, plus other emerging techniques, doctors can learn to successfully treat children diagnosed with ASD. This entry was posted on Sunday, October 4th, 2015 at 4:03 pm	and is filed under >ALL<, AD/HD, Alternative and Complementary Medicine for ASD, Asperger's Syndrome, Autism Therapies, Conferences, Diets, Earliest Red Flags, Gastrointestinal Issue, Genetics, Holidays & Vacations, News-Maybe-Worthy, Patient experiences, Research, Reversing autism, Sensory issues, Special Guests, Special Therapies, Speech and Language, Vitamin B12, Vitamin D. You can follow any responses to this entry through the RSS 2.0 feed. You can leave a response, or trackback from your own site. You can add another improving child to your list. Since our second visit Tom continues to show so much improvement!!!!!!! You can add Breeze to the list as well! Since we began the glutathione she has really improved! She now notices the dog barking, notices me pass by her when she’s in her playpen, but most remarkable is she has began to imitate me saying mama, and tried to stand up yesterday! Thank you from the bottom of my heart! We will see you again in a few weeks!